Super Mule, 6x6, late 50s, 2 1/2-ton capacity with either hydropneumatic or coil spring suspension. Picture from book of Fred Crismon ‘US Military Wheeled Vehicles’, Crestline Publishing (Motorbook), 1983. Condec 6x6, floatable, 1963-64. This vehicle was built at Detroit Arsenal with Condec to test hydrostatic transmission. Picture from book of Fred Crismon ‘US Military Wheeled Vehicles’, Crestline Publishing (Motorbook), 1983. Kramer 6x6, UF 1003, 1970 : 120 hp, 8 t capacity, 70 km/h. Kramer, from 1925, became in 2008 Kramer Werke GmbH, Überlingen, Germany, of Waker Neuson SE which manufactures wheeled loaders. TAM, Tovarna Avtomobilov Maribor, 4x4 110 T7 BV4 and 6x6 150 T11BV in 1975. Plant at Beograd, Yugoslavia. Scania SBAT111 6x6 Truck 1976 from Sweden. Amphibitruck, 6x6, 2003, payload 550 kg and 360 on water, 30 hp engine, about 50 km/h. From USA. www.Amphibitruck.com which seems unfortunately shut. 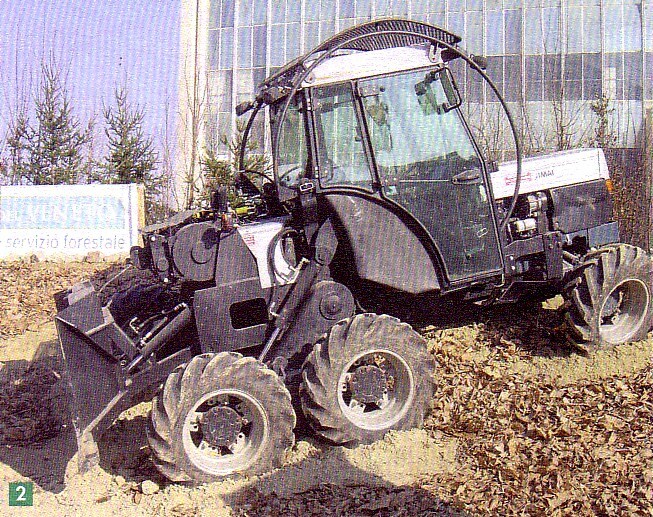 New Proto Forestry Skidder from Padova University and Isma, Agricutural Reseach Institute, Landini, Pozza, from also Alpenscooter, Imai, and Officina Tollot, all from Italy, in 2003 at Forestry Expo, Padova. From 'Mécanisation Forestière', April 2003. ALA-25M was a light tractor from Russia for firefighting in forests issued from T-25. It was fitted with pendulum suspension allowing to overcome obstacles. http://www.fermer. Desert Raider 6x6, 2007, of Automotives Industries Ltd, Israël. Seiga Giant Tortoise buoyant-wheeled vehicle, early 80s, for peat bog work built by Robert Trillo Limited which formed in 1969 a consultancy for hovercrafts and wheeled amphibious vehicles. Tayreed Company from Perth was created for reed harvesting. Seiga vehicles are now built in Bethlen, Hungary. AEC 6x6 Type 850, built at 33 units by Associated Equipment Company at Southhall, Middlesex, GB, between 1929 and 1936 for towing artillery. Mass 9 t, 95 hp engine, 8-10 persons could be transported. Most were abandoned at Dunkirk in 1940. Pict J M Maclou at Duxford Museum, GB, August 2002. AEC Type 850, 6x6. Pict J M M at Duxford Museum, GB, August 2002. Volvo 6x6 at Lagoda Trophy. Bucher-Guyer AG Duro 6x6 and 4x4 whose 2000 were bought by Swiss Army between 1993 and 1999. Then, Mowag bought patents. 4x4 version had a payload of 2,2 t. Interconnexion between all the wheels gave it good off-road capabilities. This one has been pictured by J M M at Villepinte in June 2002. Krupp 6x4 Protze Boxer designed since 1934 as L2H43 and from 1937 to 1941 as L2H 143. Total Mass 14 t, 52 hp air cooled engine, Speed 70 km/h engine. Note independent suspensions. Pict J M M at Beltring, England, 2004 07. Latil M2TZ 6x6 at Cavaillon, from Pico Center in the 90s. Pict from 'Wheels and Tracks' N° 57, 1996. Berliet VPR2 6x6 prototype from 1932-36. Weight : 4.5 T, maximum slope : 60%, 53 km/h, Twin wheels were mounted on central axle and outer wheels at the end of arms enabled to keep ground contact. From review 'GBM' Jan-Feb-March 2009. Berliet VPH 6x6 at Val d'Isère. Pict from review 'Passion 4x4' 1995 10. Berliet VPH 6x6 had 4 wheels steering on extreme axles. Two copies were made but no series due to its complexity. This restored 6x6 was shown at Val d'Isère in August 1995. Pict from Passion 4x4, 1995 10. Laffly W15T, 6x6, 52 hp, total mass 4,5 t was also made by Hotchkiss. Pict from the book of Bart H. Vanderveen ‘The Observers Fighting Vehicles Directory WWII’, Warne, 1972. Laffly S15R, 6x6, 1937-39 and by Hotchkiss in 1945-46. 52 hp, independent front suspension. Pict from the book of Bart H. Vanderveen ‘The Observers Army Vehicles Directory from to 1940', Warne, 1972. Laffly 6x6 S 15 R at Samur Museum, Feb 2002. Pict J M M.
Laffly S35 TL, 1937 at Fondation Marius Berliet, Le Montellier, 2005 05. Pict J M M.
Laffly 6x6 at Escadron de l'Histoire, Sourdun Forest, France, September 1993. Pict J M M.
Laffly W 15 T 6x6 at Limieux near Abbeville, Normandy on 1993 05 30. About 600 produced from 1938 to 1940. 82 hp, Payload 800 kg, 72 km/h, Suspensions and transmission, Hollos patented, were very sophisticated to allow good off-road performance. Nevertheless, this mechanic was not always very reliable. Pict J M M.
Laffly W 15 T 6x6 La Ferté Alais on June 6 1998. Pict J M M.
at La Locomotion en Fête at La Ferté Alais on June 1997. Pict J M M.
Laffly S 15 R 6x6 at La Ferté Alais on June 1997. Pict J M M.
Laffly W 15 T, 6x6, 1937. Pict from Saumur Museum. Laffly W 15 T 6x6 rear view showing the long travel suspensions which were patented from the Hollos Austrian patent. The W15T and all the range were manufactured by Laffly, Hotchkiss and La Licorne. Nowadays, surviving Laffly were built after WWII between August 1944 and December 1946. Laffly Company, Asnières, lasted from 1898 to the 50's. Pict J M M at La Ferté Alais on June 1997. ZIL-132R, 6x6, 1972-74, 5 t payload. engineer from SKB is here driving, on the middle picture. Mule 6x6 with a device to overcome obstacles. Pict from Armada International, June Jul 2008. 6X6 Economite XM Amphibian on sale on ebay in 2009. LADA Niva on youtube : lada NIVA 6x6 off-road, from Slovenia. Qinetic 6x6 was the 6x6 Dera of 1998. Pict of Chris Hodge. Saurer 6x6, 1939 prototype from Saurer Company, Suresnes, France, subsidiary of Saurer, Switzerland. Pict from collection of J G Jeudy and F Vauvillier in the review GBM April-May, 2008. GMC WWII with dual front wheels. Pict J M M at Loco en Fête, La Ferté Alais, 2008 06. Chevrolet C-15 Series converted into 6x6 by Engesa, Engenheiros Especializados SA, Sao Paulo, Brazil, in 1969. Similar conversions on Dodge D-100 and Ford-100 Series. Pict from the book of Bart H. Vanderveen ‘The Observers Military vehicles Directory from 1945’, Warne, 1972. Chevrolet C-65, 6x6, LWB, converted by Engesa with Fruehauf rear bogie. Payload 14 tons. Pict from the book of Bart H. Vanderveen ‘The Observers Military vehicles Directory from 1945’, Warne, 1972. 'Tractor' 6x6 and 4x4 for oil industries and agriculture, from New Zeland. Pict from book 'Off-Highway Trucks of the World' by C.J. Fraser, Haynes Publishing Group England, 1985. Lockheed Martin 6x6. Adjustable height of the chassis allowed better off-road capabilities. -forum.de Probably a vehicle from China. 6x6 vehicle from Russia. Seen on Internet about 2005. Volvo 6x6. Pict J M M , Strägnäs, Sweden, 2010 04. Supacat with flotation pontoons. Pict from Review 'V M International' 1986 08-10. Lockheed Martin SMSS Squad Mission Support System vehicle, 6x6, 2010, tested in Colorado. Capacity 540 kg. Economite, 6x6, 1968, designed for 200 hours missions and to be thrown. Built by G.L.Bowen & Company, Oak Parc, Michigan. Picture from book of Fred Crismon ‘US Military Wheeled Vehicles’, Crestline Publishing (Motorbook), 1983. Humbert Hexonaut air portable 6x6 of Rootes Group's, Coventry in 1942-43, to be used in jungle but not completely amphibious. 2 x14 hp engines, one for each side were fitted but turning on road was difficult due to the grip of tyres and one engine only used for this maneuver. From Wheels and Tracks N° 35, 1991. Pinzgauer 6x6 Steyr Puch and 4x4, Graz, Austria, were produced from 1971 until 1985 for civilians and governments at 18300 copies. Since 2000, they are produced under license by Automotive Technik, BAE Land Systems at Guilford, Surrey, GB. Independent suspensions and beam-frame gives it good off-road capabilities. Grizzly 24 wheels, and 16 wheels, made by John Doolr of Trans-Tech Vehicles Inc, Sudbury, Ontario, Canada in the 80s. From General Photos page 1 of the site www.route6x6.com. Poncin VP 5000 of Véhicules Poncin SA, Tournes, Ardennes, was a 6x6 amphibious vehicle marketed in the early 80s at the price of 28.800 € in October 1984. Renault Engine 64 hp, hydraulic transmission. Pict from 'Autoverte', Oct 1984. Super Jeep 6x6, 1943. Add a third axle to a Jeep needed an extended chassis to the light basic design but did not extend much payload. Even if mobility was improved, the help of men to rescue a bogged down 4x4 Jeep was no more possible with a 6x6. Pict J M M at Locomotion en Fête, La Ferté Alais, 2007 06. Ford M151 6x6. Pict J M M at la Locomotion en Fête, La Ferté Allais, 2010 06. Ford XM 408 at Jacques Littlefield Collection, Portola Valley, California, on June 2001. Pict J M Maclou. XM-408 of 1963 issued from Ford M151, 6x6, from 1958. Equipped with agricultural tires, it was tested during RAVE II exercise. Later tests concluded that it was unsuitable for replacement of 3/4 ton M37B1. Picture from book of Fred Crismon ‘US Military Wheeled Vehicles’, Crestline Publishing (Motorbook), 1983. Stump Jumper of TNJ Murray with different tyres. Saurer 6x6, 1936, Switzerland. http://shusharmor. NIMR 6x6 from United Arab Emirates. Payload 3.5 T. Pict J M M at Villepinte, June 2012. GAZ-69 with 4 rear roll-tires in the 50s. Pict from book of Alain Dupouy, Auto-éditeur : 'Les véhicules tout-terrain N° 11 Tome I'. 1995.